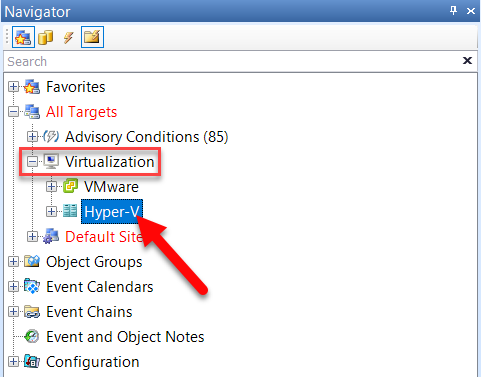 The Virtualization node houses the support for VMware and Hyper-V virtualization options. 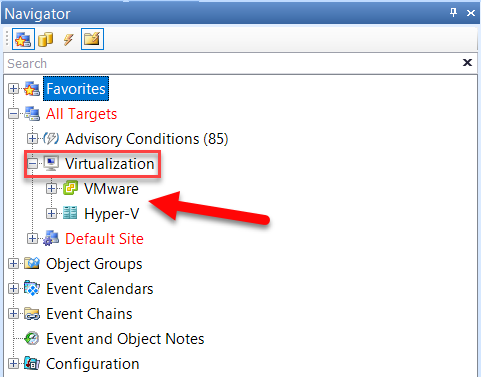 To add a vCenter, right-click on the VMware node in the Navigator pane, and then select Add vCenter. Enter the display name and your credentials, or check the box to select Use Windows session authentication. Select the Site drop-down menu to choose which site will be responsible for the monitoring of the vCenter. Note: To add a vCenter, the monitoring service must be a configured user on the vCenter implementation and must have read-only access at minimum. For more information, see the V Sentry Overview topic. Important: If using SSPI authentication, be sure to select a site where the monitoring service has at least read-only access to the vCenter. Whenever a Hyper-V guest or host is monitored with SentryOne, it appears under the Hyper-V node. If the host is monitored with SentryOne, all of the host's guests appear as well. If only a guest is watched with SentryOne, that guest's host displays. For more information, see the Win Sentry Overview topic.